Enjoy the amenities of a resort in a spacious and inviting townhome on Lake Superior. The living room features comfortable leather furniture to sit back and relax and enjoy the Lake Superior views. The open layout living room is bright and inviting. Enjoy the unique Northwoods decor in Windsong 626. The living room also features a Smart TV and gas fireplace. The modern kitchen is perfect for preparing meals during your stay. You will love the granite countertops and stainless steel appliances, including a dishwasher. There`s seating for four at the breakfast bar. Seating for 6 in the bright and cheery dining room. The open layout is perfect for spending time together as a family during your stay. The large master bedroom is a prominent feature of this lovely townhome and is located on the upper level of the home. The room features a king bed and in-room jetted tub. There is a seating area with a gas fireplace and television. Wash your worries away in the the in-room jetted tub. Off the dining room you will find a lake-facing balcony that allows you to enjoy Lake Superior views. Enjoy your morning coffee while also enjoying these views. Or take a step out onto the private balcony off the master bedroom and take in Lake Superior views. The attached master bathroom has a large vanity sink. The attached master bathroom also has a walk-in shower. The second guest bedroom, also located on the upper level, features a queen bed. This room also has a TV and an attached bathroom. The attached bathroom has a walk-in shower. The third bedroom, located on the main floor, also has a queen bed and in-room TV. The main floor bathroom has a shower/tub combo. This bathroom can be accessed from the main floor bedroom as well as the hallway. This large entry way gives you plenty of room to take off your boots and hang up your coats. Consider Windsong 626 your North Shore home away from home View of the lake-facing side of the house Windsong 626 is the unit on the right. Walk down the trail to the rocky shoreline area. The trail to the shoreline can be tricky with some loose rocks, please walk carefully. The shoreline area provides great views of Lake Superior. Looking up the shore, towards the town of Beaver Bay. Looking down the shore towards Cove Point Lodge. One of the great community features available to you as a guest of Windsong 626 is this indoor pool area- open Memorial Day weekend through New Year`s. There is also a sauna in the pool house area that you can enjoy- open all year long. The community BBQ area features two charcoal BBQs and picnic benches. Just behind the BBQ area is the community fire pit, great for getting to know fellow travelers. 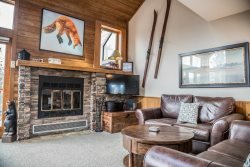 Located adjacent to Cove Point Lodge, Windsong 626 is a warm and inviting vacation rental townhome in Beaver Bay, MN. This home features a large, bright, and open living area with a spacious living room, modern kitchen, and inviting dining area. From the large windows throughout, you can enjoy the views of Lake Superior. Feel the warmth of the two gas fireplaces and enjoy the many amenities offered at Cove Point Lodge- including an indoor swimming pool (seasonal) and sauna. Windsong 626 is a two story, 3 bedroom, 3 bathroom townhome located on a hill overlooking Lake Superior. Shared lake access is just a short walk away, as well as the community area featuring the indoor pool, sauna, a BBQ area and fire pit. There is also a restaurant and bar within easy walking distance. The home and community have everything you want in a modern vacation townhome. The kitchen features granite countertops and stainless steel appliances, while the master bedroom is like a home in itself with a sitting area, in-room jetted tub and lake-facing balcony. Beaver Bay is located along Lake Superior's North Shore in Lake County, about 30 minutes from Two Harbors and an hour from Duluth. The area features plenty to do for the outdoor lover- miles of hiking, biking, and cross-country ski trails are practically in your backyard! Split Rock Lighthouse and State Park is just a 5-minute drive back down the shore. Head just a few miles up the shore and you'll hit Palisade Head and Tettegouche State Park where you can take a hike out to Shovel Point or to a scenic waterfall. The town of Beaver Bay features some lovely restaurants and gift shops. Be sure to check out the Agate Shop! No matter the season, there's plenty to do on Lake Superior's North Shore, including fishing, biking, cross-country skiing or simply relaxing on your balcony and watching the ships on the Lake. Calling Windsong 626 home during your time on the North Shore gives you access to all of this and more! House was nice. Location was really good. The only thing that we had a problem with was that we never received a key card to use the pool.